External metal staircases offer a practical solution for building owners looking to provide a safe means of evacuation. 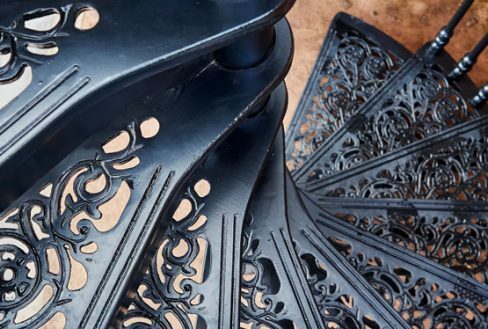 Usually customers who need these functional pieces tend to opt for simple designs such as our LCC or Diamond staircases. 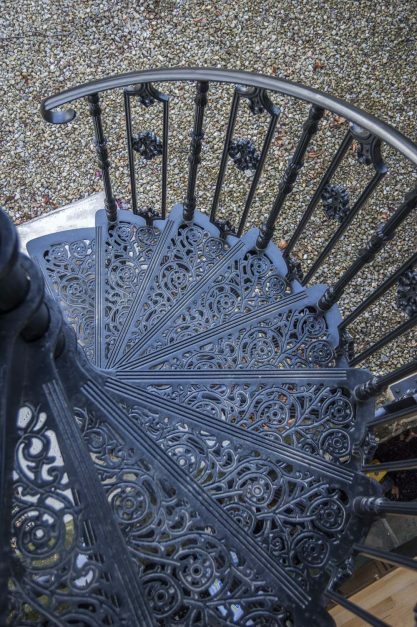 On a recent refurbishment, however, we had the opportunity to create a grander set of fire escape stairs – a double storey Victorian spiral staircase with matching balconies. 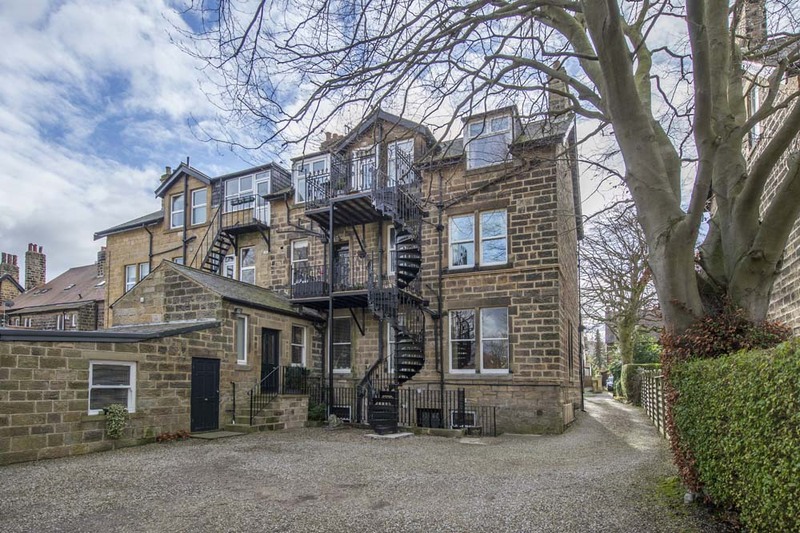 The staircase was manufactured for a 19th Century villa in picturesque spa town of Harrogate. Over time, the three-storey house had been converted into three separate flats and, in the 1960s, a metal fire escape was installed. 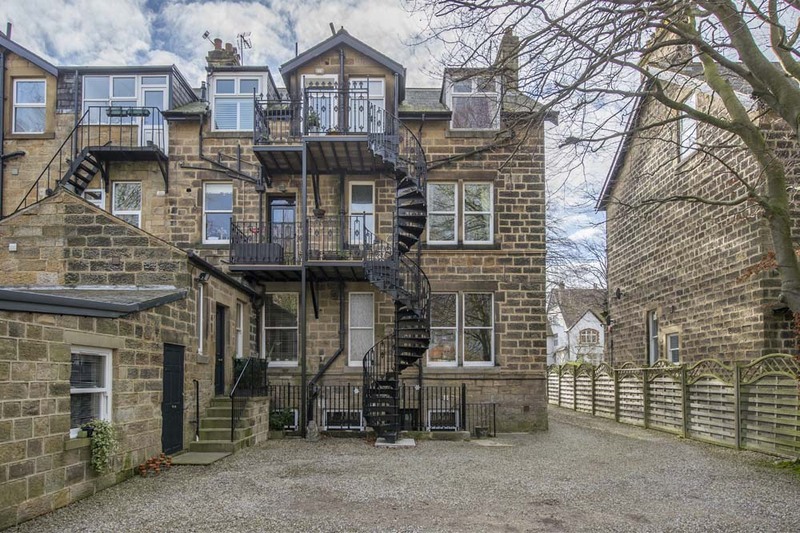 Whilst serving its purpose, the industrial style stairs clashed with the traditional sandstone of the building and intruded on the privacy of the lower flats. In 2016, the owners agreed to purchase a new staircase which was both safer and more in keeping with the architectural style in the surrounding conservation zone. After looking around, they got in touch with us. The first challenge was finding a design which complimented the building and was to the taste of all the flat owners. 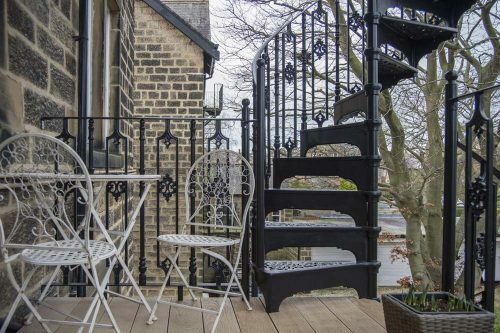 Given the age of the property, our Victorian style cast aluminium stairs and balconies seemed a good fit. 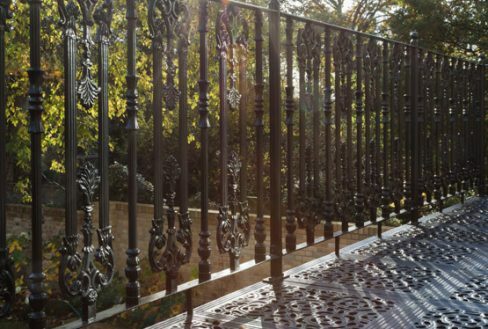 For the balustrading, the owners opted to alternate between a simple spindle and an ornamental panel. 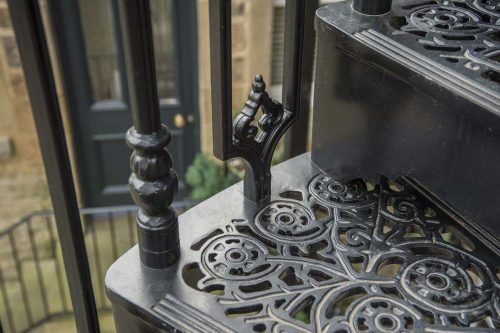 This reflects the more ornate style of the Victorian period whilst also meeting the Building Regulation requirements. As a final touch, fleur de lis style finials were also used to top the uppermost balcony. At 28 feet tall, the staircase posed some engineering challenges which were further complicated by the age and form of the building. In addition to an array of gutters and drain pipes, the walls themselves weren’t actually straight! To ensure a strong structure, the expanded balconies were designed with two main posts (including the central post of the spiral staircase) and decorative gallows brackets. 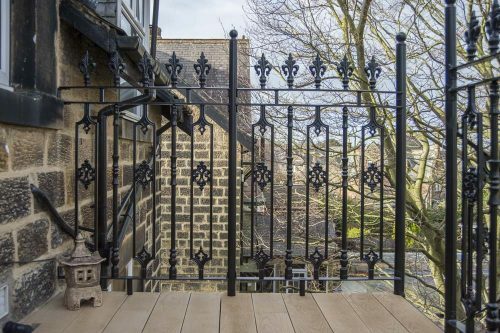 The balcony gratings were carefully measured and manufactured to slot around the existing down pipes. A narrow diameter spiral staircase was selected to prevent the stairs directly passing any windows — giving each homeowner privacy. Once the design was agreed, our team got to work casting, refining and powder coating all the elements before delivering them. Despite the narrow site dimensions, Marshall and Wallace’s experienced installation team were able to complete the work quickly and efficiently. 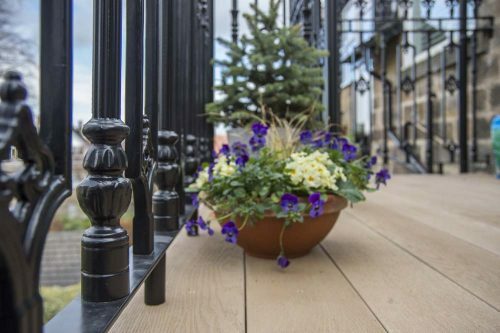 Interested in a bespoke staircase or balcony for your own property? Take a look at our website, request a quote or — if you have any queries — get in touch via phone, email or by visiting our showroom here in beautiful Derbyshire.